As we ring in the new year, medical providers now can say goodbye to the CMS’s “Meaningful Use Incentive Program” (MU) and start preparing for the new Medicare incentive program. The Medicare Access and CHIP Reauthorization Act of 2015 (MACRA) ended the Sustainable Growth Rate formula, which threatened clinicians participating in Medicare with potential payment penalties for 13 years. Most Medicare Providers will be part of MIPS. They will earn a payment adjustment based on evidence-based and practice-specific quality data submitted. According to CMS, the Quality Payment Program policy will reform Medicare payments for more than 600,000 clinicians across the U.S. Providers participating in the program in 2017 will submit their data by March 2018 and based on submission, their 2019 Medicare payments will be adjusted up, down, or not at all. MIPS is broken down into four categories and is setup so that the more Providers participate (and attest to), the higher score (and incentive) providers will get. A Medicare provider who does not participate at all (0%) may see up to 4% negative adjustment in 2019. A provider with a minimal amount of participation (e.g. submit one measure) may be able to avoid adjustment. For partial submission (submit the minimums for a partial year) they will see neutral or positive adjustments, and submit a full year and earn a positive payment adjustment. 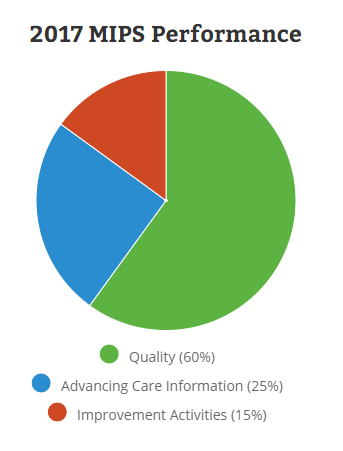 Most Providers will report up to 6 quality measures (including an outcome type measure). Quality measures selected should be focused based on type of care and specialty as appropriate. Reporting period must be a minimum of 90 days. There are over 250 quality measures available, be sure to check your health record software system to see which ones they support (can help gather data for you) when planning. Measures go across many specialties and problem sets: For example, “Age Appropriate Screen Colonoscopy” – Report the percentage of patients greater than 85 years old seen by the Provider who received a colonoscopy screening Jan 1 to December 31. Most Providers will attest to completing a minimum of 4 improvement activities for at least 90 days. As of the writing of this blog, the CMS tools shows 92 activities to choose from. Activities range from care coordination, patient safety changes and beneficiary engagements. Examples: Join and participate (for a minimum of 6 months) in your States Prescription Monitoring Program (PMP). Or another example: Engage patients, family and caregivers in developing a plan of care and prioritizing their goals for action, documented in the certified EHR technology. Use a qualified (certified) product (or products) for a minimum of 90 days. The cost category will be calculated in 2017, but will not be used to determine your payment adjustment. In 2018, CMS will start using the cost category to determine your payment adjustment. Medicare Providers will want to research the programs and decide their level of participation early in 2017. Full year participation would require making sure their Electronic Health Record system is setup for minimal data tracking and other required features like E-Prescribing and Direct Messaging. Primary nonadherence occurs when prescriptions written by a physician are never filled by the patient and is a common problem. A study published by JAMA Dermatology1 shows that the use of electronic prescribing increases the likelihood of patients picking up their prescriptions. The study looked at 4,318 prescriptions written for 2,496 patients. Of these, 803 patients received electronic prescriptions and 1,693 received written paper prescriptions. Overall, the primary nonadherence rate was 31.6%. However, when comparing the electronic prescriptions to the paper prescriptions, the primary nonadherence rate was lowered by 16%. Only 15.2% of patients who received an electronic prescription did not fill it. Why does e-prescribing increase adherence? A huge part of it might be because e-prescribing eliminates the need to drop off the prescription at the pharmacy and can significantly reduce wait times. Electronic prescribing allows the Pharmacy to begin filling a prescription before the patient has even left the Doctors office. It is a huge difference to a patient who can just “swing by” the pharmacy and pick up their prescription, versus handing a prescription to the pharmacist and waiting for them to fill it. Another factor, may be that many Pharmacies call to remind patients to pick up prescriptions. If the patient doesn’t show up, the Pharmacy will follow up and remind them their prescription is ready and waiting. A paper prescription many times never gets to a pharmacist, hence no one reminds them it is waiting. Medication non-adherence can have many negative health consequences for patients. The JAMA study is a prime example of just how important e-Prescribing is to not only help prescribers and pharmacists, but to also improve adherence in patients. New York State Attorney General Eric Schneiderman’s office sent a letter1 September 20th asking Governor Andrew Cuomo to veto two bills seen as loopholes to the newly implemented Internet System for Tracking Over-Prescribing (I-STOP) laws. I-STOP mandates electronic prescribing in New York and requires prescribers to check the state Prescription Monitoring Progarm (PMP) before prescribing controlled substances. The goal is to prevent drug abuse and drug seeking and increase patient safety. Read more about I-STOP here. The first bill (S.6778/A.9334)2 relates to nursing homes. It would provide an exception to the requirement to e-Prescribe for prescribers in nursing homes. The reasoning behind the bill is that prescribers are not in nursing homes 24 hours a day and patients need to get their medications in a timely manner. The letter requesting the veto points out that oral prescription orders are already allowed in emergency situations which should suffice any true needs and the bill would only serve to weaken I-STOP. The Deputy Attorney General, Brian Mahanna, stated in the letter that healthcare errors and drug diversion are particularly problematic in nursing homes and electronic prescribing has proven to reduce them. Not only does electronic prescribing reduce errors such as illegible handwriting and increase patient safety, it offers the ability for an on-call Long Term Care prescriber to approve and send medications even when they are away from the facility. Many software systems (including MDToolbox) have easy to use mobile apps and web versions that can be securely accessed from wherever the prescriber is. The second bill (S.6779-B/A.9335-B)3 would provide an exception to prescribers who write paper prescriptions from having to report them to the state Department of Health. I-STOP requires all prescriptions to be sent electronically, but there are three statutory exemptions. These include a temporary electrical or technical failure, if e-Prescribing would result in a delay that would adversely impact a patient’s health, or if the prescription is to be filled out-of-state. Currently, if a prescriber writes a paper prescription because of one of these exemptions they are required to file a report with the Department of Health. The bill removes this requirement and only calls for a notation in the patient’s record. Mahanna states in his letter this bill would “create a gaping loophole in ISTOP’s universal e-Prescribing reporting requirements.” He points out that prescribers could avoid compliance with I-STOP and “doctor shopping” patients could lie about a prescription being filled out of state. The two bills passed the NYS legislature earlier this year and were just delivered to the Governor. Will Massachusetts be the Next State to Require EPCS? All eyes have been on New York State as their I-STOP law requiring prescriptions to be sent electronically went into effect in March. Electronic Prescribing of Controlled Substances (EPCS) and non-controlled substances is mandatory across the state. Due to this mandate, New York leads the nation with the highest percentage of e-Prescribing pharmacies and prescribers. Other states are looking to New York to see how successful their mandate is and some have started to follow suit. Maine is following New York by requiring controlled substance prescriptions to be sent electronically by July 2017. However, Maine is not requiring non-controlled substances to be prescribed electronically. It would follow that if prescribers are sending controlled substances electronically, they will most likely prescribe non-controlled substances through the same route though. Their law is in combination with required use of their state Prescription Monitoring Program (PMP) in an effort to combat opiate abuse. Read more about it in our post Maine to Require e-Prescribing of Controlled Substances. Minnesota was actually the first state to require electronic prescribing. However, there are no penalties for writing paper prescriptions so many prescribers still pick up their paper pad when they need to prescribe. According to Surescripts’ National Progress Report1, in 2015 Minnesota ranked 24th compared with other states with less than 3% of their prescribers enabled for EPCS. Massachusetts just launched an updated version of their state PMP to the tune of $6.2 million. They updated it with the aim of making it easier and faster for prescribers to use, as the old system was said to be very difficult to navigate and severely underutilized. The system now also offers interstate operability by giving Massachusetts prescribers access to data from other states. Currently, the number of other states’ data available is limited but the system has the potential to connect with up to 45 other states. Other updates include the ability to sync with EMRs, the ability to easily assign delegates to check the system on the prescriber’s behalf, and allowing for easy reporting to compare prescribing practices with other physicians. Starting October 15th, prescribers will be required to check the state PMP any time they prescribe a schedule II or schedule III drug, as opposed to the current requirement of only checking the first time they prescribe one of these drugs. Now that Massachusetts has their new PMP in place, it is rumored they may be the next state to require EPCS. They ranked number 9 in Surescripts’ National Progress Report with over 90% of their pharmacies enabled for EPCS, but the percent of prescribers with EPCS capabilities was only 4%. As of last week, 63% of their prescribers who had prescribed opioids were registered with the PMP but the number is growing daily. At MDToolbox, we are watching closely in anticipation to see which state will be the next to take this important step in combating drug fraud and abuse. As of June 2016, the oral antidepressant drug named Brintellix (vortioxetine) has changed to Trintellix. The drug is used to treat major depressive disorder in adults and nothing about the drug has changed except the name. The formulation, indication and dosages have not changed. The name change is due to confusion with a similarly named drug. The anti-blood clotting therapy Brilinta (ticagrelor) has been reported as being confused with Brintellix and causing prescribing and dispensing errors. During the transition period, providers, pharmacists, and patients may still see bottles labeled with the brand name Brintellix. New shipments will have the new name, but pharmacists may still dispense their current stock that has the old name on it. Prescribers are encouraged to include the generic name of the medication to reduce the risk of name confusion during the transition. In MDToolbox, you will see the generic name is already included for you in parenthesis next to the Trintillex name for this reason. Patients also need to make sure they received the right medication. The Trintellix tablets look exactly the same as the Brintellix tablets. In response to a significant number of electronic prescriptions being sent by individuals who were not allowed to transmit them, the Nevada State Board of Pharmacy recently sent out a communique addressing exactly who is allowed to send new electronic prescriptions. The only ones allowed to send electronic prescriptions in Nevada are the prescribers themselves. Agents such as medical assistants (M.A.s), registered nurses (R.N.s), and other office staff are not allowed to transmit electronic prescriptions for the prescribers. (b) Transmit the prescription using that computer system to a pharmacy specified by the patient for whom the practitioner issues the prescription. The Nevada State Board of Pharmacy has instructed all pharmacists to diligently check each electronic prescription they receive was submitted by a prescriber only. Any electronic prescription that states the agent is anyone other than a practitioner is considered invalid and won’t be accepted or filled. The only thing M.A.s and R.N.s are allowed to do is authorize refills on behalf of the practitioner. It cannot be a new electronic prescription acting as a refill though, it must clearly be a refill. Nevada is not the only state with such laws on the books. There are many states with similar laws and it is important for prescribers to understand and follow the laws pertaining to e-Prescribing in their individual state. Last week the governor of Maine signed into law “An Act To Prevent Opiate Abuse by Strengthening the Controlled Substances Prescription Monitoring Program.” In addition to mandated use of the state Prescription Monitoring Program (PMP), the law will require prescribers to electronically prescribe controlled substances. This will be a big change for many prescribers. Currently, as little as seven percent of prescribers use the state PMP and according to Surescripts, less than one percent of controlled substance prescriptions were sent electronically in Maine in 2015. Maine follows New York and Minnesota in mandating e-Prescribing of controlled substances, although Minnesota does not enforce the requirement. New York’s law, which requires e-Prescribing of both non-controlled and controlled substances, went into effect last month. Several more states have similar laws up for legislative discussion as well. It’s clear that now is the time for anyone not e-Prescribing yet to get started. MDToolbox is offering free trials for anyone who wants to test out e-Prescribing as either a standalone solution for prescribers or an integration solution for Health IT vendors, click here for more information or contact us at 206-331-420 or info@mdtoolbox.com. Prescribers who issue prescriptions in any of these circumstances may use the Official New York State Prescription Form or issue the prescription orally. The waiver is effective until March 26, 2017. Before that time, the Commissioner of Health will reevaluate whether the e-Prescribing software available has adequate functionality for these exceptional circumstances. The New York State Internet System for Tracking Over-Prescribing (I-STOP) Act mandates that all prescriptions, both controlled and non-controlled, be sent electronically. Last year the deadline for prescribers to meet the regulation was postponed until March 27, 2016. This new deadline is fast approaching. In order to comply with I-STOP, prescribers must select and use a certified electronic prescribing computer application that meets all federal requirements for electronic prescriptions for controlled substances (EPCS). This includes going through Identity Proofing and setting up 2-Factor authentication. The practitioner must also register each unique certified computer application used to electronically prescribe controlled substances with the New York State Department of Health (DOH), Bureau of Narcotic Enforcement (BNE). MDToolbox has a simple signup process for both standard e-Prescribing and to setup EPCS. Most prescribers can complete the required ID proofing and 2-Factor Authentication setup within one day, but we also urge prescribers in NY to get started as soon as possible. This will ensure time to complete the application process and get all staff setup and trained.